I am a food engineer with a focus on process and equipment design. I have received a PhD on food process engineering from Berlin Technical University in 2006. I have since then focussed my project, management and teaching activities on process efficiency and targeted energy use in food industry. Since 2017 I am Managing Director at Elea Gmbh. Elea is market leader in distrubtion of Pulsed Electric Fields (PEF) systems for food and bioprocessing industry including potato, fruit juice and smoothie treatment. In April/May 2015 I have conducted a stay as visiting professor at the Department of Food Science and Technology at University of California, Davis, teaching Advanced Food Processing Techniques. Since 2014 I am Advanced Research Manager at the German Institute of Food Technologies (DIL), active in project and customer aquisition. 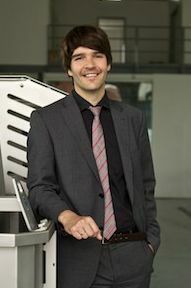 Since 2009 I am professor for food process engineering at the University of Applied Sciences in Osnabrück. I am teaching Food Technology, Plant and Process Design, Process Intensification as well as Innovation and Patent Management. In 2009 I have been awarded the Georg Carl Hahn Award. 2006 to 2014 I have headed the Business Unit Process Technologies at the German Institute of Food Technologies (DIL). With a team of scientists we developed processing technologies for food industry and equipment manufacturers. Scientific board of Die Lebensmittelwirtschaft e.V.